A chinese, mexican dish? Does it sound like one? The most popular "masala puri" pesented in a unique mouth watering form. 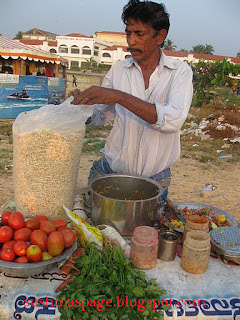 The puffed rice in its unique masala form presented called "Chanburo" in Konkani language "Churmuri" in Kannada. This Salesman is found at the Malpe Sea Shore, selling churmuri. Mobile shop can say. The last time I visited Malpe I have taken this shot while eating the scrumptious food that he made. Method: Nothing special. All ingredients to be mixed in order, garnished by oil and coriander leaves. I dedicate this post to the C-Day of round 9 of ABC Wednesday meme. Please click here for details and more shots. This sounds great! Thanks for the recipe and the visit to my blog. I look forward to more visits! Chamburo!! Thats a new one for me. Learnt one work in Konkani.. 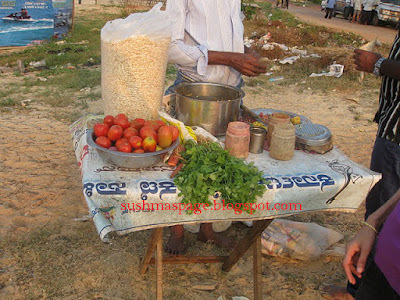 But I love these roadside delicacies. never had it, but sounds tasty. My mouth is watering as I read. Will try the recipe. Thank you! Thanks for that, it sounds delicious. All I can say is "yummy, yummy, yummy"!